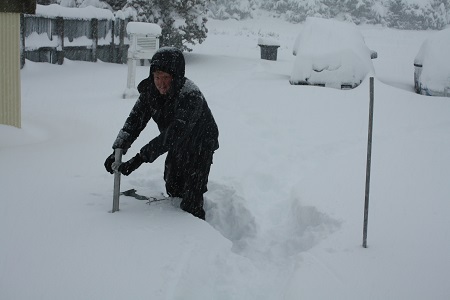 Sciblogs | NIWA’s Citizen Snow Project: How deep is the snow at your place? NIWA’s Citizen Snow Project: How deep is the snow at your place? With the current storm crossing the country this week, NIWA has kicked off its Citizen Snow Project. The project seeks assistance from public at large to contribute to New Zealand’s snow science research by gathering snow measurements at home, in their neighbourhood, or wherever they may be. The new data will go alongside data collected by NIWA and other organisations, and will help build up a better picture of how much snow falls during severe storms, particularly at low elevations. The information would be used to plan emergency responses in the future and to help gauge the risk of traffic disruptions, infrastructure damage and agricultural losses. Members of the public are asked to make measurements of snow depth and snow density, using a ruler, a small saucepan, and their stove (see instructions here). The data will be uploaded to the NIWA website and pooled with other people’s measurements. The project continues previous years’ efforts here at Waiology and Facebook in 2012 and 2011. Because of the risks during these cold conditions, eager citizen scientists are advised to put safety first and follow CDEM instructions before venturing outdoors. 45 cm snow at five rivers (jollies pass) 350 m asl. Very cool project. We took part last year when living in Christchurch. If you have a ‘citizen wind’ project we can help with that!! We had a window ripped off its hinges at home. Deluged with rain, not snow.